If I'm perfectly honest, I have to admit that I'm not a great party-goer. While I'm not an introvert, I'd rather snuggle up with a book than go to a party any time. 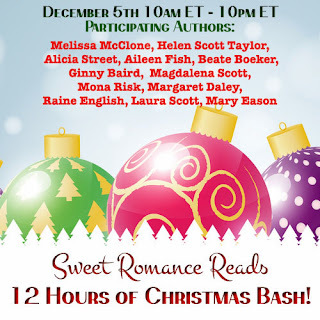 So I signed up as one of the hosts for the Sweet Romance Christmas Bash with trepidation, but I did it because I really wanted to know what all this partying on Facebook was all about! It couldn't be as bad as that, I figured, after all, I didn't even have to dress up. Well, it was a steep learning curve - and it was more fun than expected! 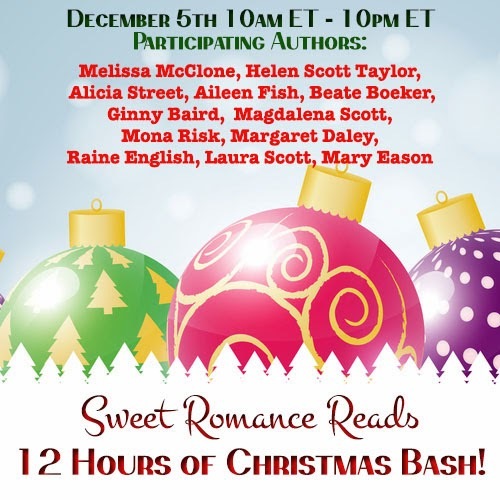 When we put our twelve heads together, it soon became apparent that we had a great mix of authors here. Everybody contributed something - and I don't only mean money for the big prize and free e-books for lucky winners - no, I mean talent. Some of our authors are power women with exceptional organizational skills and the talent to keep all of us in line while fighting illnesses and writing with tight deadlines, others contributed pictures and created artwork and answered technical questions, one knew how to master the Rafflecopter, one organized a huge spreadsheet with every post detailed in advance, one gave a loan of her personal assistant, so she could pre-set everything on Facebook - the list is endless! I was impressed and grateful to be part of such an energetic and professional group. And then the big day dawned, and I can tell you, I was very nervous of dropping the drinks (or maybe not even finding them during this cyber-party!). However, it worked out very well. Slightly out of breath, I jumped from post to post much as a hosts goes from group to group and learned so much. I loved the way our readers shared their Christmas experiences - some sad, some uplifting - how some told us that the hero they wanted most underneath that mistletoe was still their husband, and of course, the singing. Oh, the singing. The idea was that everybody enters one line of a song, and the next commenter enters the next line. However, due to slight delays while posting, several of us sang the same line and maybe it was a good thing after all that you couldn't really hear us - but it was fun! 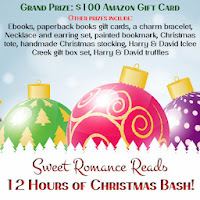 Over 60 prizes were awarded to readers/party goers and Eileen Aberman-Wells won our grand prize - $100 Amazon Gift Card! 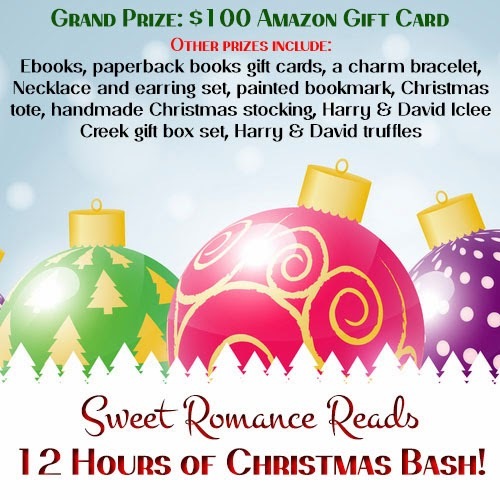 We're still contacting winners (and if you think you've won something but haven't heard from us, please drop us a note on our Sweet Romance Reads Facebook page). The best part about having this party was getting to know new readers, to touch them with our stories and our gifts, and to make them a little bit happier than they were before. Thank you to all who joined! You can find more info about Beate at her website. Her new release Stormy Times is available at Amazon. Thanks, Beate, and to all who organized the Christmas Bash behind the scene! I dropped in several times, scooped up some of those party favors and snacked on the various discussion groups ... all without really thinking about the preparation it must have taken to keep the party hopping so smoothly. Well done! Congrats on Raffle Copter, BTW ... I tried participating in a contest with that once before and something didn't work right. Yours was flawless. 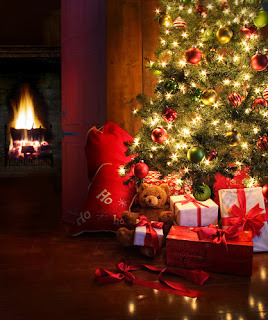 I know I'll have more chances to say this ... but Merry Christmas! Great re-cap. I had planned to attend but the time difference was a bit more problematic than I thought. Sounds like everyone had such a great time - really wish I'd been there!! And I am impressed with the skills from this group, a fabulous pool of talent. Thank you, Sierra, Joanne and Ginny! I enjoyed myself so much and hope we'll find the time to throw another party together at some point in the future! I'm not a party fan either, but I had a great time hosting the Christmas Bash. It was lovely to see so many people take part and obviously enjoy themselves. Great event summary, Beate!